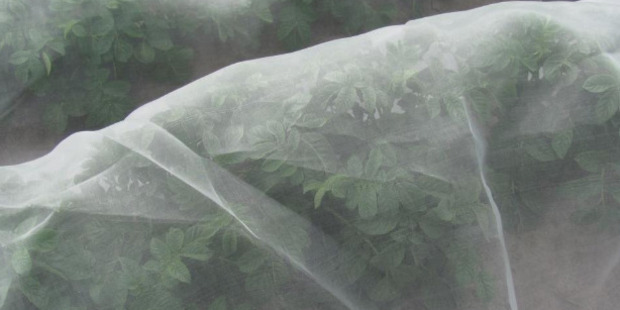 The use of fine mesh covers could be the answer to controlling the tomato potato psyllid. Dr Charles Merfield, the head of the BHU Future Farming Centre, who has been researching the use of mesh in potato crops, believes the problem of the psyllid may be solved. The latest research by the farming centre compared an agrichemical regime with three meshes of different hole size: 0.3, 0.4 and 0.7mm. Agrichemicals had a total of 1614 psyllids, while the meshes had four, five and three psyllids. ''The result is utterly stunning. It is, effectively, complete control of TPP,'' Dr Merfield said. Other benefits of the mesh were also found. It created a more favourable microclimate, which enhanced crop growth and yield. The yield from crops grown under mesh increased by 10t/ha. The marketable yields were even more impressive, Dr Merfield said. Another benefit was that mesh was cheaper than chemicals - about $1000 per hectare less. Research on the use of mesh crop covers on potatoes started at the Future Farming Centre at Lincoln in 2011 and focused on the control of tomato potato psyllid (TPP, Bactericera cockerelli). The latest research showed that, as in previous trials, aphids got under the mesh and large populations started to build. All other options for how aphids could be getting under the mesh were now considered exhausted and it was believed that winged adults were alighting on the mesh, producing nymphs that could then penetrate it. Due to the very small holes that aphid nymphs could get through, coupled with mesh inevitably getting damaged/holed in real-world use, a biocontrol programme based on existing glasshouse experience needed to be developed to control any aphids that got under the mesh, along with the residual TPP, the interim report of the research said. Low blight levels this year meant the trial had produced little information on blight, apart from an indication that mesh and agrichemicals achieved similar control of blight at lower levels than the control crop. The interim report said a range of future research was considered vital to create a fully farm-ready mesh system for potatoes.